Just like people, Asian dumplings come in all different shapes and sizes. 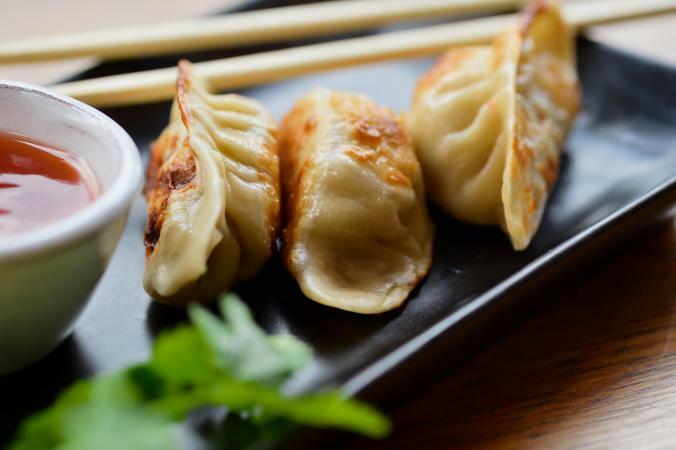 There are Korean Guun-Mandu, Japanese Yaki-Gyōza and Chinese Guōtiē, Wortip and what most people know as "pot stickers." These recipes will cover the latter dumpling - pot stickers with a pork filling and a variation with shrimp filling. The perfect way to cook these Asian dumplings is to pan fry first and then steam them to delicious tenderness. There are many good dumpling and wonton wrappers in the Asian refrigerated sections of most markets (sometimes also found near produce) so making them from scratch shouldn't be necessary. Still, if you can't find the premade version, try following an easy wrapper recipe instead. In a medium bowl, mix pork, mushrooms, green onion, water chestnuts, celery, bamboo shoots, coriander, and fresh ginger until well incorporated. Blend soy sauce and cornstarch, and add to pork mixture along with egg white. Mix thoroughly. Refrigerate for 1 hour and then divide into 48 equal balls. 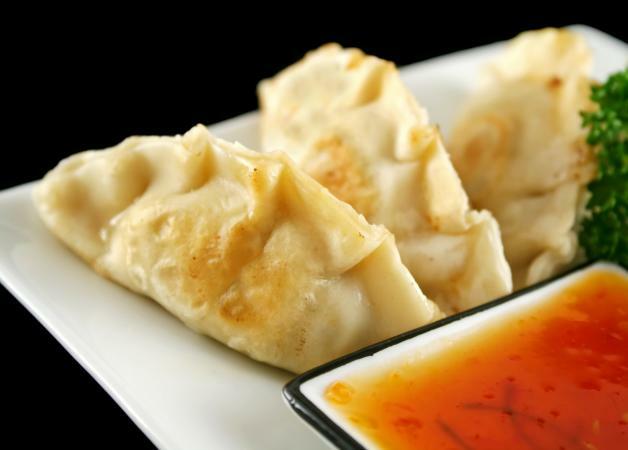 While the dumpling mixture is chilling, make the hoisin dipping sauce. In a small bowl blend hoisin sauce, sesame oil, and sriracha with a whisk. Lay 48 dumpling wrappers on a lightly floured table or work surface. Place a pork ball onto the center of each piece of dough. For round dumpling wrappers, moisten edges with water and fold dough in half, pushing out any trapped air. Crimp the edges, sealing well. For square dumpling wrappers, moisten edges with water and fold one point to the other point, sealing well and pushing out any trapped air. With point facing up, moisten the ends of the two side points and stick them together as for tortellini. Make sure there is enough flour on the work surface so the assembled dumplings don't stick. You will need to cook in batches or in two pans. Heat a large lidded skillet over medium heat (lid off). When hot - but not smoking - add oil to cover the bottom of the pan. Lay the dumplings in a single layer in the pan trying not to let them touch. Cook for 1 to 2 minutes or until the bottoms are lightly browned. When lightly browned, carefully pour in 1/4 cup water (guard against hot splashes) and immediately cover with lid to trap the steam. Let cook for 2 minutes, then uncover and cook for another 2 minutes or until all the water has evaporated. If dumplings are sticking and not browning, add a little more oil, lifting the dumplings and letting the oil flow underneath. When dumplings are nicely browned, remove, place on a serving tray, and keep warm while you cook the remaining dumplings. Garnish with sesame seeds and green onions and serve with hoisin dipping sauce or non-spicy sauce variation (below). Swap out shrimp for pork and you can easily make delicious seafood dumplings that will go with the dipping sauce. Ingredients will be the same as the original recipe except for the filling. Chop shrimp by hand or in a food processor until it becomes a paste and measure exactly 2 cups. Combine shrimp paste with bamboo shoots, fresh ginger, coriander, pork fat, anise seed, pepper and salt. Chill mixture, covered, for 1 hour to make it easier to handle. While waiting for the filling to chill, make the hoisin dipping sauce from the original recipe or make the non-spicy dipping sauce variation (below). Divide into 30 equal-sized balls. Place 30 dumpling wrappers on a lightly floured table or work surface. Set a shrimp ball onto the center of each wrapper. Continue following original recipe directions starting with step 2 in Assemble the Dumplings. If hoisin sauce is too hot for you, try making this non-spicy variation that goes well with the original pork recipe or the shrimp variation. In a small bowl, whisk together soy sauce, rice vinegar, sugar, garlic and sesame oil. Cooked dumplings can be stored, covered, in the refrigerator for up to 1 week. Reheat by steaming them for 5 minutes. Freeze cooked or uncooked dumplings on a parchment-lined sheet pan (make sure they're not touching). Transfer to a zip-top bag and freeze for up to 3 months. Remove as many as you need and let them thaw without touching before cooking. Or drop frozen dumplings into hot chicken broth and serve as soup. Dumplings don't have to be made with ground pork or seafood. Cooked Chinese sausages, barbecued pork and minced beef can be substituted for the ground pork. Once you have the hang of these easy dumplings, try a couple recipes for international dumplings from Lebanon and Tibet. Vegans, vegetarians and those with wheat issues also can enjoy this tasty treat with the right recipe. If you don't feel like cooking, Feel Good Foods is a good source for purchased gluten-free dumplings.